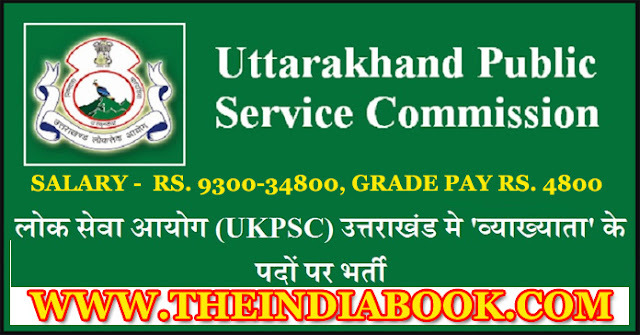 UKPSC RECRUITMENT INFORMATION : Uttarakhand Public Service Commission (UKPSC) has opened the notification Recruitment to the post of Special Subordinate Education Service (Lecturer Cadre-Group C) (General/ Women’s Branch) Exam 2018 , Those Candidates who are interested in this Vacancies Posts , Kindly Check their Eligibility, Exam Date, Syllabus, Question Paper please read details & completed all eligibility criteria can read the Official Notification below..
For UR (Gen) Candidate With Tax Fees: 135 RS. For OBC Candidate With Tax Fees: 95 RS. For SC/ ST Candidate With Tax Fees: 95 RS. For PWD Candidate With Tax Fees: 35 RS. For Ex-Serviceman in Army Candidate With Tax Fees: 95 RS.